There’s something to be said for staying in a place where you can’t help training, at least if you want to eat breakfast. That was the reality at Maho Bay Camp on the island of St. John in the U.S. Virgin Islands. It was four in the afternoon, and I was sitting in the open air pavilion that sits high up on a hill that overlooks the bay. It was that hour when vessels of every size and shape make their way home after a day of adventures on the water. I was thinking to myself that either Maho Bay is a dream, or that other place — where bitter winds strip leaves from the trees and water freezes in the lakes — that place is a dream. They couldn’t both exist in the same moral universe. I never expected in my lifetime to visit the Virgin Islands. Nothing really prepared me for it. My family always believed in staying put during the winter. My dad liked to lay in the supplies and try to outlast the season. On the day I was born, a blizzard dropped two feet of snow on my home town. With that background, I’ve always considered it an act of folly, if not a failure of character, to try to escape the cold by jetting off to some exotic location. So what was I doing here, in November, swimming in the aquamarine waters, relaxing in sandals and a t-shirt as cool breezes fanned my brow? Well, I could blame it on Ann — it was her 50th birthday, and that milestone had become the pretext for this unprecedented trip. Or I could point to the fact that our week away from New England coincided with having our kitchen torn apart as the first step in a wholesale renovation that would have us eating from the microwave for four weeks. In any case, there we were. The tents were connected by a series of boardwalks and stairs with whimsical names like Lizard Lane, Peahen Parkway, Crab Ramble Road, and Lost Donkey Highway. If there were slides, it would have been like a life-size version of Chutes and Ladders. In this tent city, if we needed to go anywhere, we had to ascend or descend a great many flights of stairs. Ann and I were in Tent E28, which was near the top of the hillside. Between the beach to our tent, there were 365 stairs. I know that because I counted every one of them three separate times. The uphill version of this journey took about eight minutes. Of course, we were always carrying something, adding to the fun. It didn’t take me long to conclude that I was getting a pretty good workout just walking up and down the stairs. Of course, I was also running for about 30 minutes every morning, and those runs weren’t flat either. The final 500 meters of my morning run ascended this same hill from a different side and involved climbing a grade that I estimated at 12%. The first day of doing this, and then walking up and down stairs all day, I was beat. The second day, I was looking for excuses to stay in our tent — or, having left it, to stay away. But by the third day a miracle occurred: I started getting used to it. By the fourth day, I was going out of my way to explore the vast network of walkways, finding new ways to navigate the hillside. That’s when I started counting steps and stairs. I started taking pride in our remote and inaccessible location and looked down – literally and figuratively – on those guests whose tents were near the beach. I started imagining a running camp built on such a hill, a running camp that would turn its guests into mountain goats. On the day before we left, I timed the final part of my run, and found that it took me 2:46 to climb the last hill. Later that day, we were returning from an excursion and were getting a ride from a truck that served as a taxi for the camp. On a whim, I started my watch when the truck began the long agonizing climb up the same hill I had run in the morning. Three minutes and twelve seconds later, I stopped my watch as the truck crested the climb with a final groan from its lowest gear. I showed the watch proudly to Ann sitting next to me. She just rolled her eyes and shook her head, as if to say that vacations are completely wasted on some people. 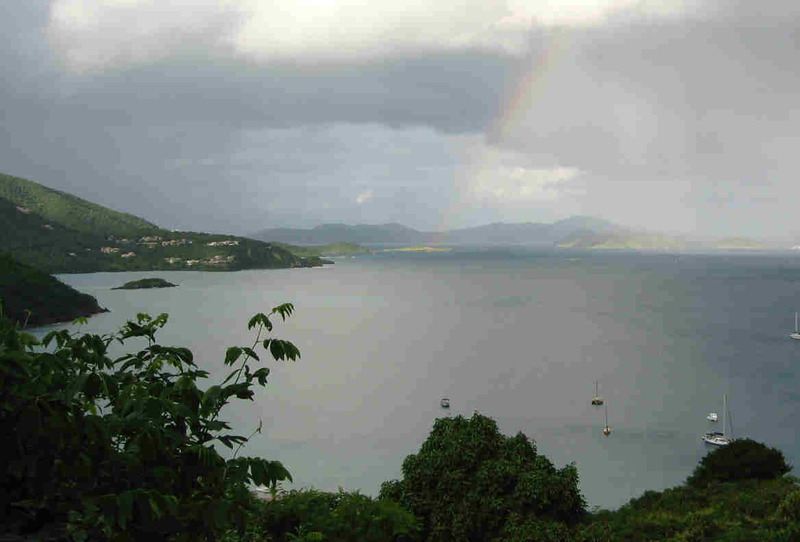 This entry was posted in Training, Weather and Seasons and tagged hill running, maho bay. Bookmark the permalink.